The Novice Windsurfer Rating allows members to sail CSC's fleet of beginner sailboards in a small practice area. The beginner boards are wide, floaty, and abuse resistant (thus heavy), and they have a centerboard to make it easier to go upwind. Novice Windsurfers can practice pretty much any time on their own, provided the Dayleader isn't restricting sailing (which can happen if it's really, really windy). The area for Novices is generally sheltered, but can be gusty, and usually offers a corner where the wind is stronger and allows practicing for the next level. 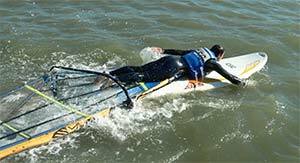 Two steps are required to get the Novice Windsurfer rating: a simple open book written test and a self-rescue (paddling) test. There is no work requirement at this level, other than the normal two hour quarterly work requirement. The written test questions include club rules and procedures, basic windsurfing concepts, and names of common sailboard parts (all covered in the CSC Handbook for Windsurfing ). 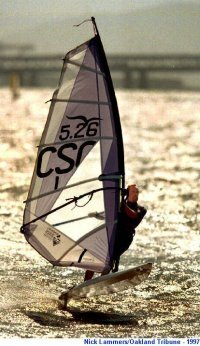 The Junior Windsurfer Rating allows members to sail CSC's fleet of intermediate (marked "J") or beginner sailboards in a larger area. The J boards are smaller and faster, and they lack centerboards. The Jr. area includes a wide expanse of shallow water that usually gets the full force of winds coming off the bay. The Jr. Windsurfer rating requires two hours' additional work, and two tests: written and sailing. The written test covers more ground than the Novice test, and is closed book. The sailing test demonstrates ability to sail upwind in strong wind and chop, even if overpowered, and to properly handle the gear. Two hours of work, in addition to the normal two hours per quarter requirement for all members, are needed before the sailing test. The Junior Plus Windsurfer rating provides use of even smaller, lighter, and faster J+ boards, and requires another two hours work, a rigging test, and demonstration of consistent ability to waterstart, since the boards are too small for easy uphauling. The rigging test demonstrates ability to rig a windsurf sail properly (downhaul tension, boom installation, etc.). The sailing area is still the Jr. area. The Senior Windsurfer rating allows use of the club's Sr. fleet of boards, primarily as a reward for exceptional levels of teaching, fixing, and doing stuff for the club, as well as ability to properly sail, handle, and care for the equipment. The Sr. boards are fast, light, fragile, and usually newer than the other club boards. The Sr. area extends out to some of the best wind on the bay. The Sr. rating requires a written test in addition to demonstration of ability and completion of a project that usually involves teaching or repair projects and requires at least 10 hours.